I love to move. No, I need to move. I grew up dancing and my body feels “normal” when it is (or has recently been) moving. Inactivity quickly makes me stiff and even a little sore. My energy levels plummet and my mood dips with a stagnant body. Most of the time I balance my workouts with “active rest days”, allowing my body to recover while still feeding my need to move with some walking or biking or yoga. Most of the time this works beautifully. Occasionally my body says “just give it a rest”, and so I do. I gave it a rest on Saturday, spending most of the day lying on a blanket listening to little Owen sing about his weary bones. I gave it a rest yesterday when I ended up spending an unexpected 9 hours in the clinic and was too tired to for even a few work jacks or push ups. My training objective for June was to push my self a little harder than I had been. July’s objective is “give it a rest”. I am still keeping up with my weekly 3 strength workouts and 2 Pilates workouts but fewer runs and fewer yoga sessions per week means more down time. August will be a push it month again. Do you plan your workouts ahead of time by the day/week/month? Do you look at the big picture and see how you can vary your workouts over time to keep your body challenged? Total change of gears: check out these mushrooms! 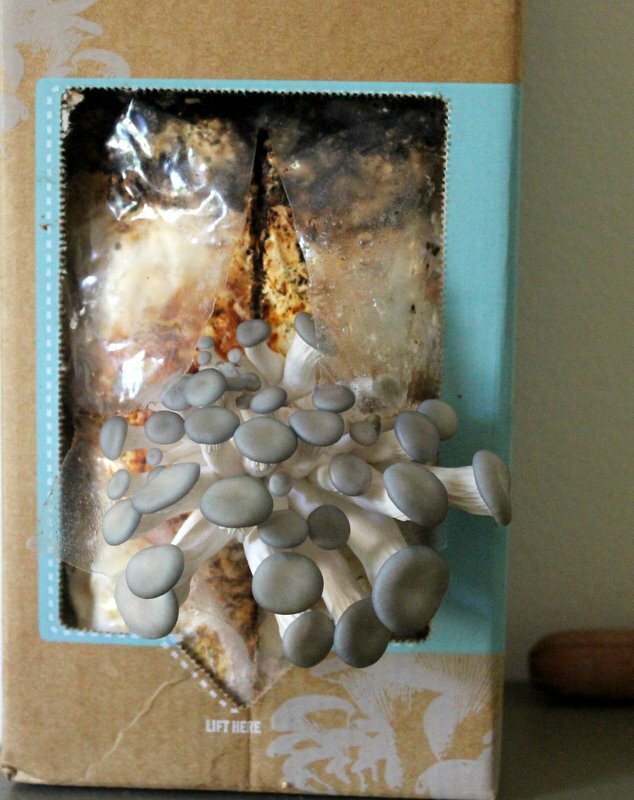 This mushroom kit is simple to use, you open it up and spray it with the included water spritzer a few times a day. Nothing happened for the first 3-4 days and then BAM! 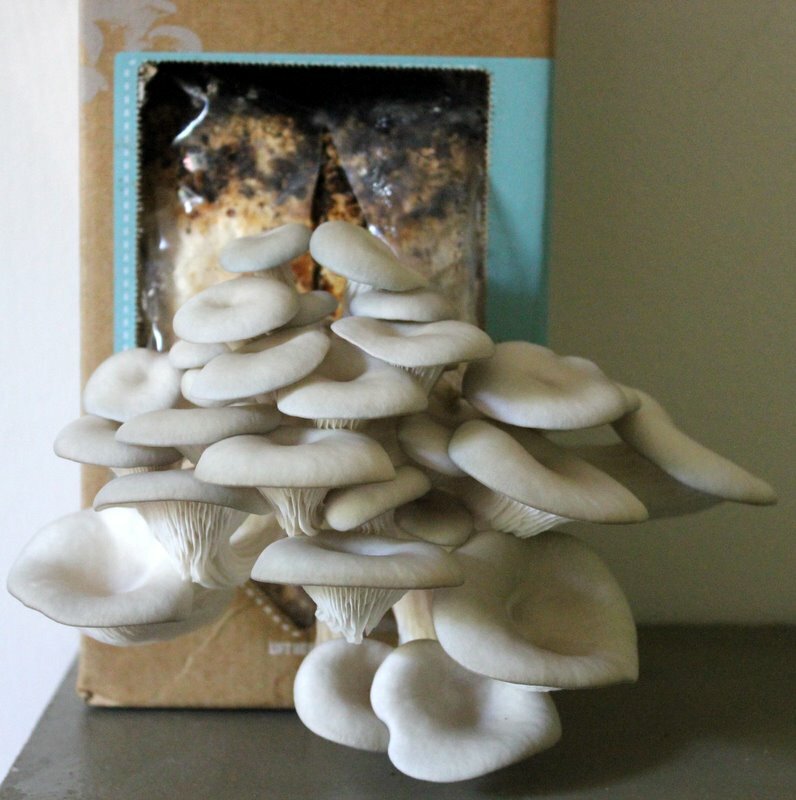 Oyster mushrooms! Here’s the fun part; Back to the Roots says that if you post a pic of your growing kit on their Facebook page they will send the classroom of your choice a kit to help teach kids about sustainability (the kit is filled with used coffee grounds from Pete’s!). 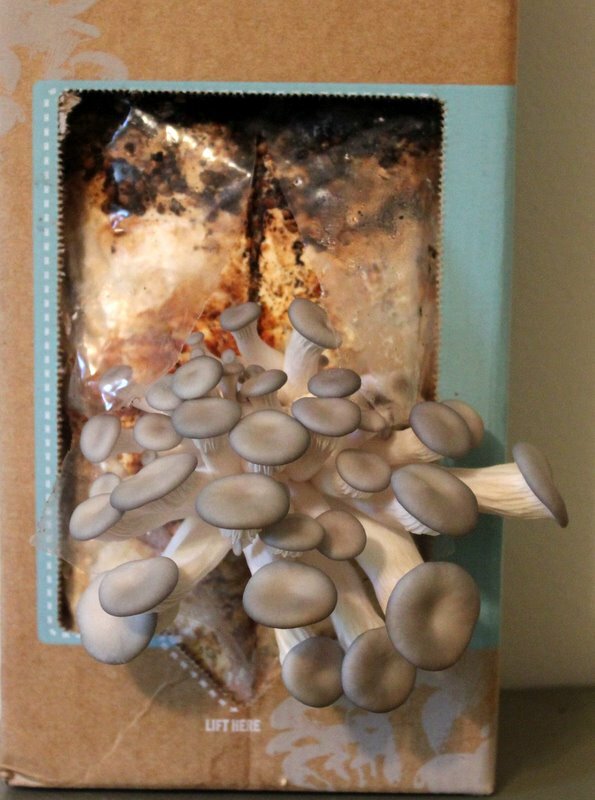 If you are a school teacher who would like to include mushroom growing in your curriculum this year, post a comment and I’ll post my pic for you! There’s only one available so the first comment will get it. Never mind. I noticed on their page it is for elementary schools. Bummer, but I totally understand. I love wild mushrooms — that is super neat! Did you get my email by chance? Don’t apologize. You’re not lame. 🙂 I know you are busy; I just wanted to make sure you got it — that my outbox didn’t eat it or something. I love this topic by the way. You are so balanced in your movement. While we love to push ourselves, it’s crucial to let our bodies recover. A lot of people miss this concept. This is super interesting to me, as I was JUST thinking about how July typically MELTS me. As you probably know, July in SLC is heinous, with little escape from the heat on the roads and the snakes on the trails. I think that’s why, every year, I make July a no-running month. It’s especially good for me this year because I’m rehabbing an old hammie injury. Usually I try to take my activity level day by day, listening closely to what my bod needs, but right now I’m forcing a running rest, which is helping me heal and try new things. Like pilates, road biking, body pump, etc. I love the synchronicity across the country! SLC is brutal. You know Emma, right? She would do wonders for your hamstring. Allie, Emma’s worked on it 4 times over the past year! She turned me loose, and now I’m getting some PRP done….paws crossed! Interesting! You’ll have to let me know how the PRP goes. WOW – you got some great shrooms!!!! I’m on box #2 waiting.. Your title sez it all. Resting is absolutely part of training. Great mushrooms BTW. I am a classroom teacher in Alaska, and would LOVE an opportunity to share these little guys with my students!!! I am a special ed classroom teacher in Hilo Hawaii….this would be awesome! I just asked them nicely to send two (Kate and Jen), maybe they will be super generous and send three! It’s worth an ask! Please send me your full name and the name of your school to gracefulfitness [at] live [dot] com and we’ll see what they can do! Whoa that is so cool. I think I might have to get one for myself! They are really fun (and tasty!). The company is definitely worthy of support as far as I can tell; they are all about sustainability! And if you post a pic they’ll send you a replacement or a new one to the classroom of your choice. They sell in some Whole Foods so you might not even need to order one!